I may not care about the Miss Universe competition at all, but it seems I do quite enjoy the polishes OPI releases for the Miss Universe competition. Last year gave us the excellent Crown Me Already! and Swimsuit, Nailed It!, and while there are only 3 polishes this year, I really love them all. First up, we have OPI I'm Feeling Sashy, the perfect purple with a hint of taupe creme. This is definitely a purple, but it feels like it has some gray/taupe mixed in, so it's grungier looking than a regular purple creme. 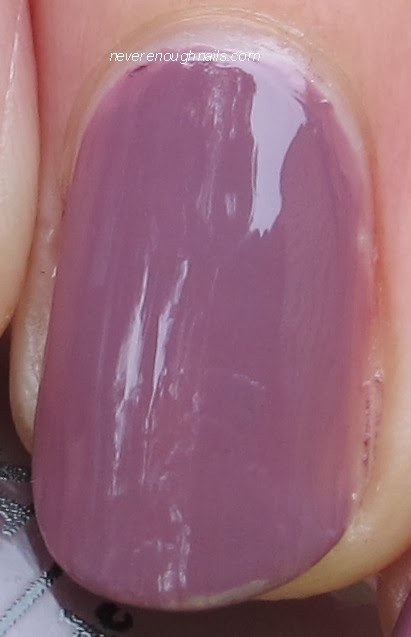 It reminded me of the same purple with a neutral kick feeling as OPI Parlez-vous OPI?, so I actually have a comparison shot later in the post. I'm Feeling Sashy needed just two coats for full opacity and it had a great formula. No complaints! Below you can see Sashy vs. Parlez-vous OPI. As you can see, Parlez-vous is a more cool toned purple with more gray in it, while Sashy is a bit warmer. They both have that dusty feeling though. Sashy is on the pointer and ring, Parlez on the middle and pinky. This hunk of deep smoldering hotness is OPI Miss You-niverse. This was a tricky shade to photograph, it looks more purple in some lights and more blue in others. I still can't really tell you which it is, but it is a very deep, rich blurple creme. It's dark, but it never looks black, you can always tell it is a dark blurple. I think this is unique in my collection, as most of the blurples I own are either lighter or have shimmer. Miss You-niverse is a really nice fall shade alone, but I also see it being a fantastic base for glitters or flakies. Ooooh, this would be so good with flakies!! Miss You-niverse was very pleasant to work with, no issues to report at all. This is two coats and I found the formula to be a very nice consistency. While I love the two purple cremes, OPI This Gown Needs a Crown was always destined to be my favorite. For one thing, I love silvers. Silver is probably the color I reach for most in the winter. For another thing, this is a new "satin finish" that dries super fast and matte, and to keep the satin look, you don't wear a top coat. It actually kind of looks like a texture polish, but it feels totally smooth to the touch! I am a huge fan of mattes, satins, and all other fast drying polishes. As a nail blogger, I hate not having polish on, but in reality, I need something super fast. 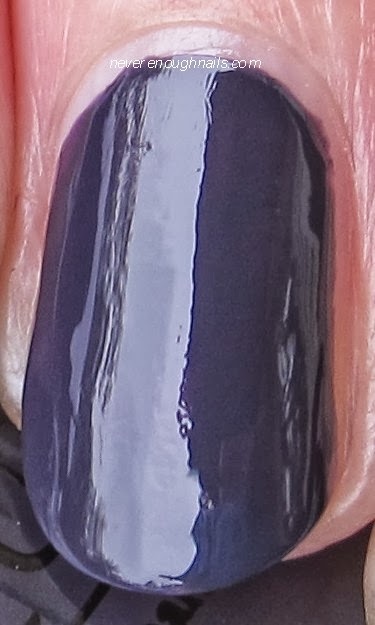 I am excited about this new satin finish and I hope OPI releases some more satin polishes. This Gown Needs a Crown did need three coats for full opacity, but it dried so quickly that didn't matter to me very much. Otherwise, the formula was excellent and easy to apply. 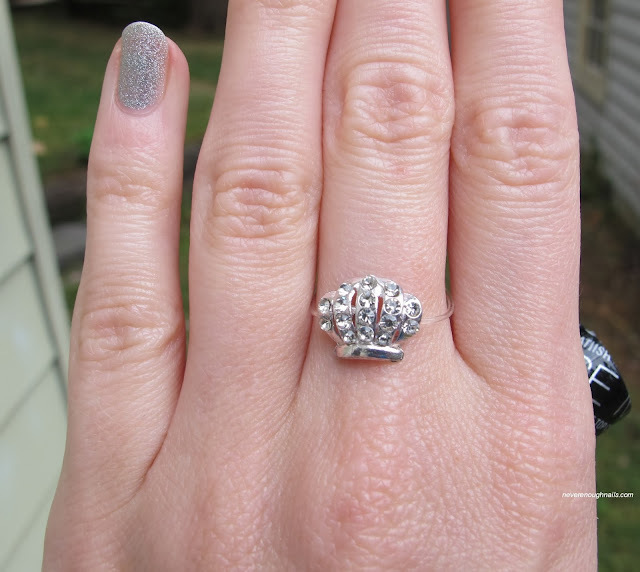 This Gown Needs a Crown also comes with this cute little crown ring! Overall, this collection is small but mighty. Out of three polishes, I love three polishes! Sometimes small, well thought-out collections are better than huge collections with four dupes of existing colors. Are you interested in any of these pretties? MISS UNIVERSE nail lacquers will be available October 2013, at Professional Salons, including Beauty Brands, Beauty First, Chatters, Dillard’s, jcp Salons, Pure Beauty, Regis, Trade Secret, ULTA and ulta.com for $9.00 ($10.95 CAN) suggested retail for each nail lacquer.